The University of Hertfordshire: ‘Near miss’ asteroid – how long until one hits? ‘Near miss’ asteroid – how long until one hits? Friday 15 February marks the day an asteroid the size of a small office block is due to pass by Earth in one of the closest ‘near-misses’ in recent history. Although thankfully researchers at the University of Hertfordshire have reassured us that there is no chance of this one actually hitting Earth – it does raise the more pressing question of – will it happen one day, and if so, what devastation will it cause? 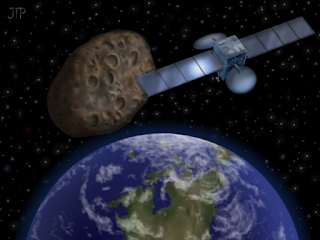 Weighing 130,000 tonnes and travelling at over 28,000 miles per hour – if this one was to hit Earth, it would likely take out an area the size of London. At Bayfordbury Observatory, astronomers Dr Mark Gallaway and David Campbell lead on a programme to monitor these ‘near earth objects’ (NEO), months, sometimes years in advance in order to understand their obit, what they are made of, and effective ways to change their path – should they be on a collision course to Earth. Mark said: “Although there is absolutely no chance of this particular asteroid hitting Earth, it does highlight the dangers of so called ‘Near Earth Objects’ of which about ten thousand of the expected one million have been identified. Too faint to see with the naked eye, the asteroid, which will pass closest to Australia on Friday night, will be visible through binoculars in the direction of the ‘plough’ constellation at approximately 9pm.